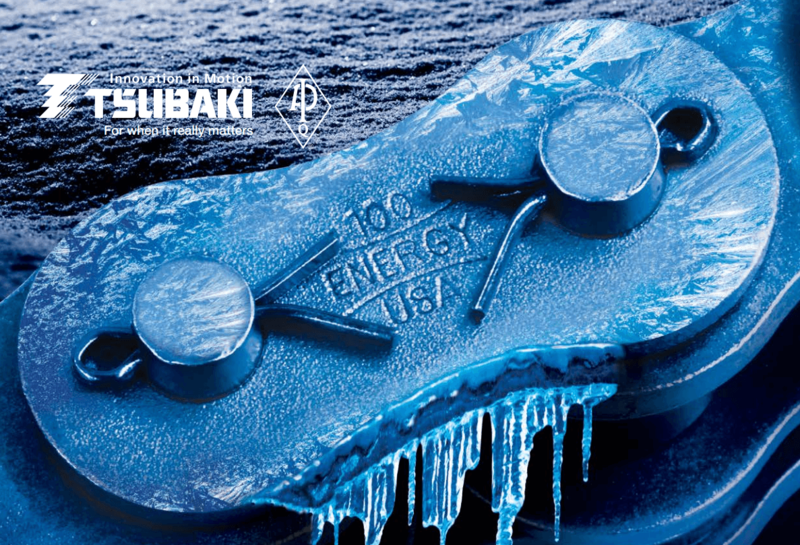 Tsubaki’s Energy Series Chain, made at our Holyoke, Massachusetts facility, is manufactured using the optimal combination of materials to allow it to work efficiently in cold temperature applications. This includes down to -40 degrees Celsius (-40 degrees Fahrenheit)! Built from highest quality steel, all parts are made to uphold specific tolerances and put under heat-treatment processes to maximize tensile strength and maintain shock load resistance. Through-hardened pins, created from special material in combination with proprietary heat-treatment, increase fatigue strength, chain life, and uphold shock loads. All chains are pre-pressed for even load distribution, to decrease initial elongation, and to aid in a smooth operation. Ballized holes for tighter tolerance, smooth hole surfaces, and maximize fatigue strength. Wider waist on plates increase fatigue life and maximize shock load tolerance, while, shot- peened link plated further aid fatigue resistance. Chain is dipped into our hot lubricant that penetrates deeply to help extend chain life. Additionally, Energy Series Chain comes with free cut-to-length service, saving you time, labour costs, and available for easy drop-in installation. For more information, please contact your local Tsubaki representative at 905-676-0400. At Tsubaki, we understand the oilfield industry. 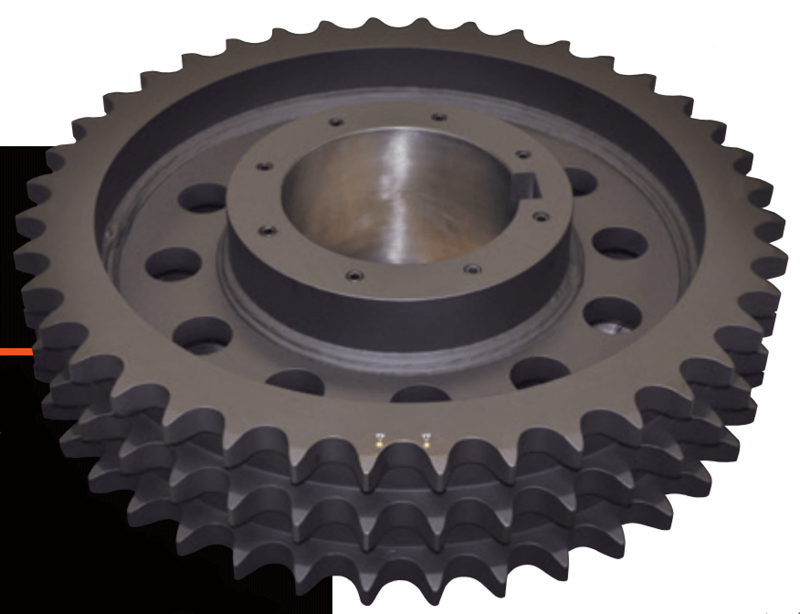 Our Energy Series sprockets are manufactured with precision to match industry standards and the high quality of our Energy Series chains. Trust Tsubaki to pair your Energy Series chains with Energy Series sprockets for maximized performance, longer life, and greater long –term savings. Our extensive years of experience within the industry have lead to the development of some key specifications that add value and reliability to your operations. 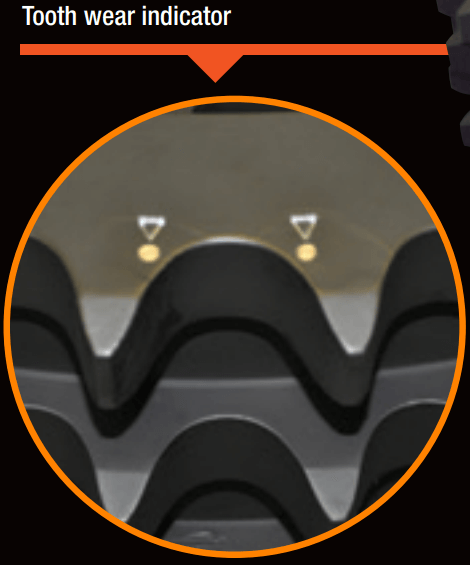 Sprocket tooth wear indicators allow you to schedule maintenance, preventing downtime due to wear before it happens. Flame hardening process gives an optimal combination of strength and wearability. Sprockets come with a minimum tooth hardness of 35Rc, which can be increased based on customer specifications. Sprockets are machine cut with high precision for higher quality. Comes with milled serialized identification and certified documentation containing hardness and depth certification. Solidworks model provided after order stage and coupon testing provided upon request. For more information on Energy Series Sprockets, please contact your local Tsubaki representative at 905-676-0400. Kabelschlepp understands your application needs for extended travel and offers top-of-the-line solutions that support your operation to maximize efficiency. The patented KabelSkate is cost effective and specifically designed for polymer carrier systems. 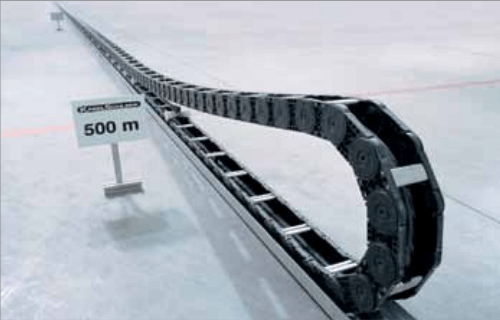 With travel capability up to 500 meters, KabelSkate doesn’t require a costly guide channel and embodies self-alignment capabilities of cable and hose carrier system. It has a simple construction, requires a minimal number of components, and only needs a flat, smooth surface outside of any traffic to run on. It is light-weight due to reduced motor size and has significantly reduced frictional factor, making it easy to move without the use of extra machinery. DynaGlide should only be used when an application calls for steel cable carrier systems, for extended travel, exceeding unsupported length more than 4x. It uses the same basic configuration as an extended travel polymer gliding in the guide channel, however, it has greater push-pull force, making it more expensive than similar systems from Kabelschlepp. It can be used in single-sided or opposing 2-sided cable carrier arrangement. RollerGlide, used with steel or polymer carrier systems, can operate in challenging environments requiring lower towing forces and higher load capabilities. This includes environments such as, but not limited to: steel mills, sewage composting facilities, and metal foundries. 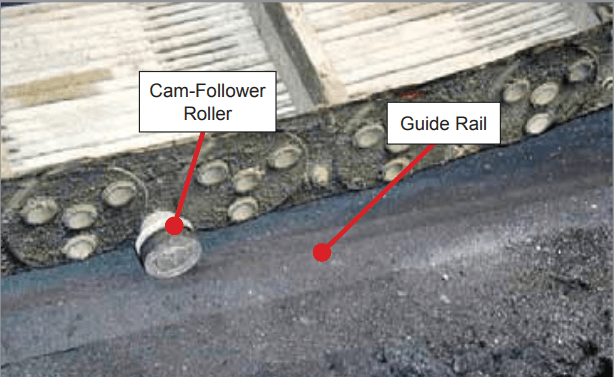 It utilizes low friction cam follower rollers, with shielded bearings, that glide on steel rail. This system is safely and accurately guided by two parallel rails that serve as a strong base to endure extremely heavy loads and high speeds. 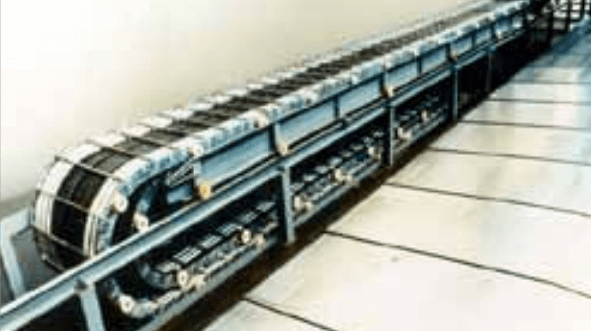 Rolling carriage systems can be used with Steel and Nylon Polymer cable carrier systems. Ideally designed for extended travel, high-speed applications for over 1 meter per second or when load and operating travel length exceeds 4x the unsupported length of the carrier. For more information on extended travel support systems, please contact your KabelSchlepp factory representative at 1-800-443-4216.